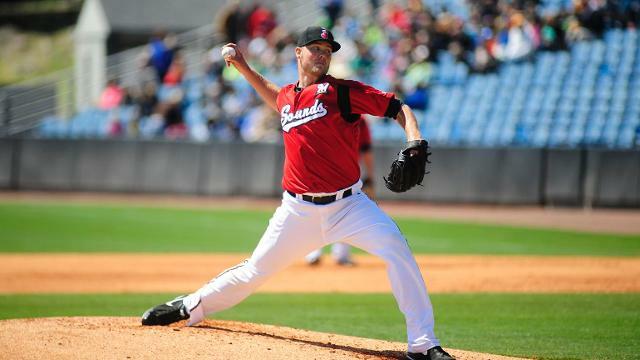 NASHVILLE, Tenn. - Former Nashville Sounds starting pitcher Jimmy Nelson was named the Pacific Coast League Pitcher of the Year on Wednesday afternoon by the league office. The 25-year-old right-hander dominated the PCL during his three-month stint with the Sounds earlier this season en route to earning a promotion to the Milwaukee Brewers. Entering the year, he had been rated by Baseball America as the organization's top prospect. In 17 outings for Nashville, Nelson went 10-2 with a minor league-leading 1.46 ERA (18er/111.0ip) while striking out 114 batters and issuing only 32 walks in his 111 innings of work. At the time of his July 11th promotion to the Brewers, Nelson led the minor leagues in ERA, ranked 3rd in the minors in strikeouts, and co-led the PCL in victories. Nelson was a near unanimous choice for Pitcher of the Year in voting by the PCL field managers and representatives from the media in each city across the league, as the only other player to receive a vote for the award was Kyle Hendricks (Iowa). He becomes the tenth hurler in the Sounds' 37-year franchise history to capture his league's Pitcher of the Year honor. Previous Sounds to earn Pitcher of the Year honors include: Johnny Hellweg (2013, Pacific Coast League), R.A. Dickey (2007, Pacific Coast League), Scott Ruffcorn (1994, American Association), Chris Hammond (1990, American Association), Stefan Wever (1982, Southern League), Jamie Werly (1981, Southern League), Andy McGaffigan (1980, Southern League), Geoff Combe (1979, Southern League), and Bruce Berenyi (1978, Southern League). Nelson worked quality efforts in 16 of his 17 Nashville outings (15 quality starts, 1 quality relief outing behind rehab starter) and held opponents to a .179 average, the lowest mark in the minors at the time of his departure. He was named as the Pacific Coast League's starting pitcher for the 2014 Triple-A All-Star Game on July 16 at Durham, his third All-Star selection in five pro seasons, but ultimately missed the contest due to his big league promotion. The Niceville, Fla. resident, who was the Brewers' 2nd round selection in the June 2010 draft, has posted a 2-5 record and 4.10 ERA (24er/52.2ip) in nine starts for Milwaukee this season. Nelson was previously named as a member of the 2014 All-PCL team on Monday, the lone Sound honored on that squad.